Éxito means success in Spanish. 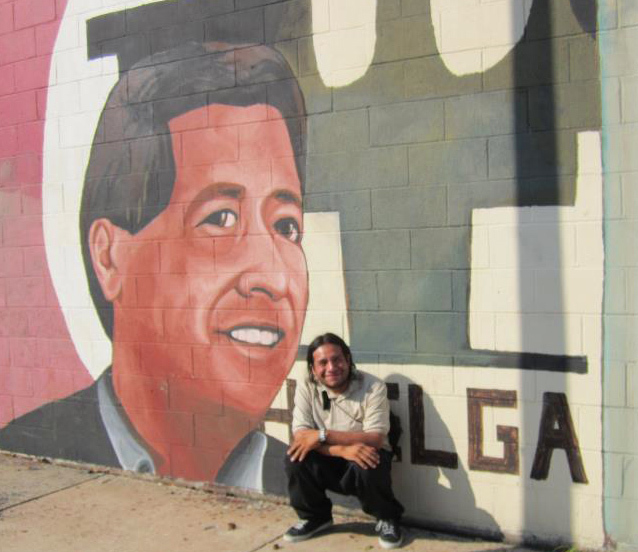 César Chávez has been in the U.S for just about two weeks. He first crossed the border on foot in Arizona. He has already forgiven the policeman there who forced him to kneel on the pavement with his hands up while drug dogs sniffed his backpack. Fortunately, César has since had a lot of great memories to replace that ugly one. Some good times in Philadelphia, some in Kutztown, some in New York City. Firelei Báez, Domincan artist in NYC gave César a tour of El Museo del Barrio. César has been working hard in the KU printmaking studio and carved two woodblocks, two linoleum blocks, and several etchings. This he did in four days. His Eckhaus party was a blast. 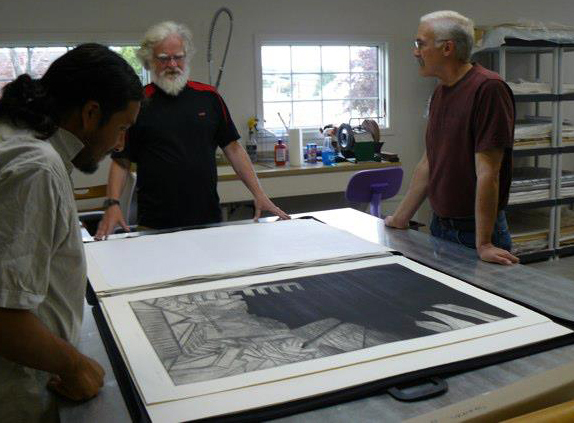 He’s toured Evan Summer’s printmaking studio, and spent the long weekend in New York City and Hoboken NJ. Firelei Báez, a rising star in the NY art world gave him a personal tour of the bienal exhibition at the El Museo del Barrio that features her work. El Museo produced a great short video about Firelei’s art. We also saw the de Kooning show at MOMA. Call me loco, but I found El Museo’s exhibition far more interesting than MOMA’s de Kooning blockbuster retrospective. He has generously interacted with numerous art and design classes. He was the honored guest at a luncheon with Spanish language students. He has worked alongside the printmaking students and given gallery tours to a hundred other students. Tomorrow 25 youngsters from I-Lead School, a largely Hispanic charter school in Reading will get a gallery tour, as well. One KU CD student, born in Nicaragua, told César he was so very proud to have a Spanish-speaking artist-in-residence at Kutztown University. César Chávez at mural of the Chicano farm worker & organizer César Chávez in Philadelphia. César’s English has improved in his short time here. He’s repeatedly said being in the U.S is “like a dream.” There was one unforgettable moment. Walking across Times Square, he encountered a showgirl hawking tickets to the musical Chicago. He asked if he could have his photo taken with her. She grabbed César in a headlock and planted a big wet kiss on his face. Sometimes, life is like a dream. Friendly New Yorker meets artist from Oaxaca. 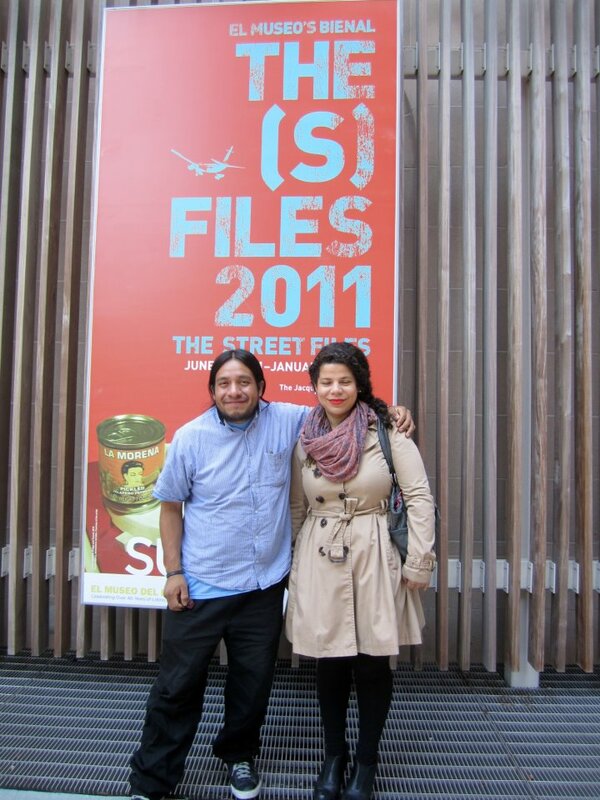 Cesar is one of the most amazing artists and print makers of Oaxaca, Mexico!!! FElicitaciones de todo corazon por este gran logro y exito!!!! Abbrasos amigo, Shalak:)! Hi Shalak Attack, Thanks for your comment. I will pass it on to Cesar. I checked out your website, wonderful murals. loved the sea turtle project. Keep up the good work!